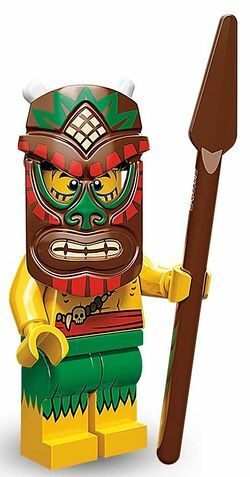 Island Warrior is a Minifigures Series 11 minifigure released in September 2013. The Island Warrior has a yellow head with a maniacal smile, along with blue tribal paint upon his face. His hair is that of the Islander from the Pirates theme, which has a removable bone within it. Concealing the head, a new large, brown, specially molded mask is included. Clipping under the head, the mask has shapes of red and green lining the eyes and mouth, as well as a mouth of barring white teeth and a similarly colored shape at the mask's top. The minfigure's torso is yellow, along with their arms and legs, has a slightly muscular nature, though is covered by a red belt, blue chest paint, and various pieces of rock jewelery. On the legs, the Island Warrior has a printed grass skirt upon their legs, though their bare yellow legs are greatly visible. A basic brown spear is also included with the minifigure. He, the Hockey Player, and the Downhill Skier all have the second-highest stats of all Minifigures. The Island Warrior keeps vigilant watch over the forbidden cove of his enchanted island home. When he spots a ship sailing near, whether it flies the skull-and-crossbones or the flag of the Imperial navy, he puts on his carved wooden mask and gets ready to drive off any un-neighborly visitors. Fortunately, he’s well prepared thanks to his friends. With a knowledge of traps learned from the Forest Maiden, lessons in stealth from the Elf, and the Leprechaun’s book full of pranks, the Island Warrior has everything he needs to send any pesky plunderers who try to invade his island packing!